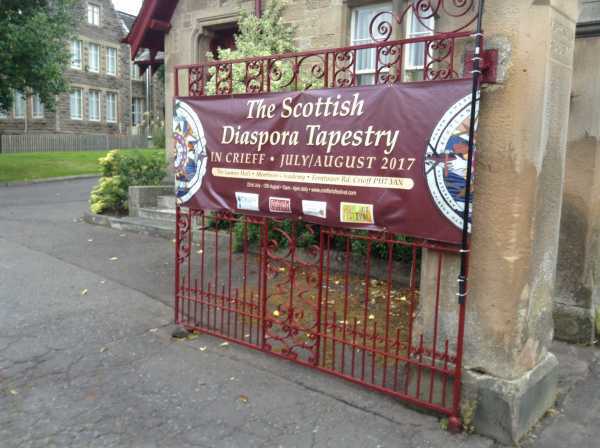 The panel that went missing at St Giles is now back on display in the Perthshire town of Crieff as the Scottish Diaspora Tapestry continues its touring with all 305 firmly in place. It's there till August 12th at Morrison's Academy Hall as part of the community's WW1 Remembrances - displayed in continent/country sequence. The exhibition formally opened on Saturday July 22nd with a lecture earlier in the week at Innerpefray Library given by Sharon Beck on behalf of the designer Andrew Crummy. 'This extraordinary artwork – which chronicles the impact of Scots who have migrated throughout the world – is being exhibited in Morrison’s Academy Games Hall in Ferntower Road. 'The tapestry left Scotland in 2014 with 155 panels to tour the world and has now doubled in size. The 305 colourful panels bring to life the many achievements of Scots across the globe, from the 10 who have held the office of UK Prime Minister to the Scots who introduced football to Argentina and Brazil. 'The event is a Crieff Arts Festival project supported by Crieff BID and Morrison’s Academy and is part of the Crieff Remembers programme of events. June added: 'Crieff is the creative heart of Strathearn, with a thriving arts scene, craft shops and galleries contributing to the vibrant community. We are incredibly proud of our local heritage too and are delighted to welcome the Scottish Diaspora Tapestry here for our residents and visitors to enjoy. 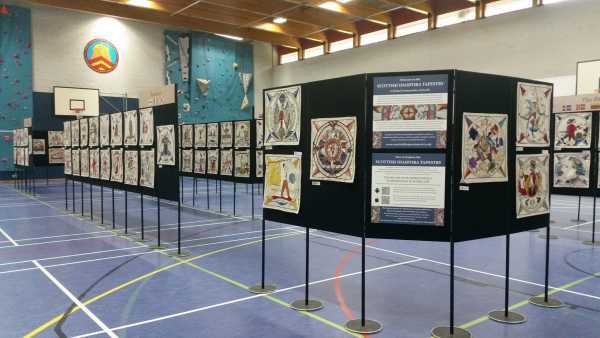 'The tapestry was conceived by the team behind the magnificent Battle of Prestonpans 1745 Tapestry and was originally assembled and displayed in Scotland as a significant element of the nation’s 2014 Homecoming celebrations. 'Communities with Scottish roots across the globe were contacted back in 2012 with an irresistible invitation: Please tell Scotland your story! Thousands internationally volunteered. No other visual arts project has ever attempted to boldly bring our Scottish Diaspora together in such a manner. 'With compelling tales being submitted from communities far and wide, artist Andrew Crummy created initial panel designs for verification by those who would be stitching them. Millions of stitches later this tapestry tells 305 enthralling tales from 34 countries, spanning seven centuries. Together they reflect the breadth and depth of Scotland’s global legacy. Ed: This exhibition is followed in September with a return to Helmsdale, which displayed the original 155 panels after launch in 2014 during The Homecoming. From there it travels to Irvine and lastly in 2017 to the Edinburgh Art Fair in the Corn Exchange. Visitor numbers grow all the while, many coming back to see the artwork again and again ... with the total since 2014 approaching 200,000 including its RTW-Global Tour; and there's a hint that 2018 might even see a new Baltic Nations Tour as well.